Browsing the web from our phones is nowadays a common thing. In fact it is now likelier to browse from your phone than from a desktop computer. Personally, I find myself using a desktop browser only while I'm at work or while doing some desktopy thing (such as coding or messing with VMs and networks). If I'm just browsing during the evening, for instance, its 99% from my phone. My preferred way of browsing is via the forum kind of applications, such as reddit or hacker news, so at that point I'm not really using a browser. However, the majority of the content is delivered from websites so you see and interesting title, tap on it, and the in-app browser or the main browser is opened. This typically works fine, until the site you're accessing is a megalith and takes tens of seconds to load. After at most 3 seconds, if barely any content has loaded, the link is forgotten and I move on the the next link. That's it. The problem is that these websites are offering too many features for them to be practical on a smartphone. Sometimes websites take even longer because they need to load the comments section, then come the suggested posts, with ultra big resolution images, followed by the author's biography... It's unnecessary, I just want to see content. 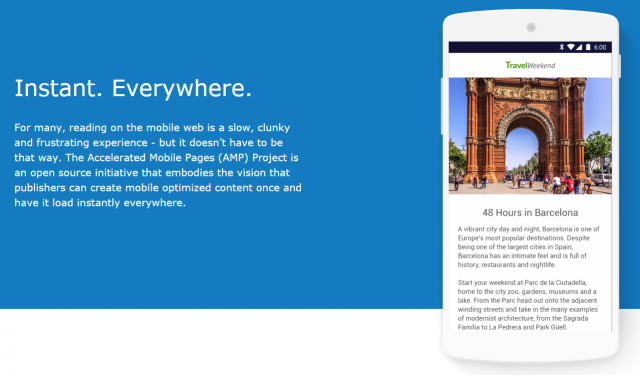 A team of internet companies, including Google, have come up with Accelerated Mobile Pages (AMP). It is primarily a technological development (not exactly unheard of, as we'll see), but through its restrictions it tries to limit the amount of unnecessary crap on pages. As I said, it's a development, however much of this development is in terms of standards and rules rather than faster networks, or something like that. The focus is primarily on immediate content. If I get a link while chatting and I open it up, I don't have more than 3 seconds to read the title and move back to the chat. Thankfully, on Android, this experience shall now improve with the new chrome tabs introduced in Marshmallow. It's a technical thing, but basically it avoids having to use either an in-app browser (which is isolated from your standard chrome) or opening up chrome (which is slow). As yet, (being days or hours since being announced) I personally do not consider this as a major breakthrough technologically - it's only a set of rules to reduce the bloat on webpages who primarily host content. However, I am very glad with the way things are going and I do hope it gains traction. Unfortunately, I don't have that much control on this blog, otherwise I would have AMP'd it right away!